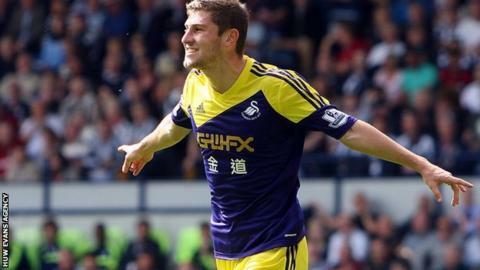 Ben Davies says Swansea can focus on the Premier League after securing their place in the Europa League knock-out stages. Swansea advanced to the last 32 of the competition despite a 1-0 defeat to St Gallen in their final group game. Left-back Davies says the Swans can now concentrate on the Premier League. "It gives us a good opportunity to focus on the Premier League with the amount of games we've got coming up," he said. "It will give us a good little break to concentrate." Michael Laudrup's side are away to Norwich City in the Premier League on Sunday ahead of a busy Christmas and New Year schedule. They host Everton on 22 December and are away to Chelsea on Boxing Day before travelling to Aston Villa two days later. On New Year's Day they host Manchester City at the Liberty Stadium but they do so having advanced in the Europa League. Swansea's final Group A game ended in a disappointing defeat with Marco Mathys's late goal securing victory for St Gallen. But the Swans made it through to the knock-out stages as Kuban Krasnodar could only draw 1-1 in Valencia. Wales defender Davies is looking forward to the knock-out stages in February, which will include the likes of Juventus, Benfica and Napoli. "It wasn't the result we were looking for but it was great to get through," Davies said of the defeat in Switzerland. "It's a great opportunity for myself and for everybody involved in this team. "This is what we were hoping for before we started the group and we've got there."